What’s a Real Life Superhero? How do you become a RLSH? Perhaps to inspire RLSHs – or in a bid to develop some user generated movie superheroes – Marvel have an online Superhero character creator. I give you: Yellow and Blue Man… a bearded sword wielding hero guaranteed to strike fear into the hearts of wrongdoers everywhere. – Why do even the best restaurants serve dishwater coffee? happy birthday. What a friendly hacker. – One of the dilemmas we face when going on holidays is feeding the fish… here’s a real time internet based fish feeder. – Another Christian response to the “clean feed”. Another chance for Senator Conroy to show just how little he understands about his portfolio. How come shops can knock 40% off the price of things on Boxing Day? Doesn’t this just mean they’re purposefully ripping us off for the rest of the year. Particularly in the lead up to the Christmas cash cow. My question from this Christmas is: Why don’t we sing carols all year round? Especially “O Holy Night”… although I can take or leave my little sister’s interpretive dance on that number. – This is my project for 2009. An Extensive, Obsessive Performance Test Of… USB Keys? I’ve been taking part in a couple of discussions (and reading others) around the net on “false teachers” lately. Basically, my position is that I think “false teachers” as described in the bible have a particular intention – while wrong teachers are just confused, like we all can be sometimes. They were largely prompted by this post on the solapanel by Gordon Cheng, who followed up with a pointer to that post on his blog. “Just to be clear, let me say that I think Brian Houston, Rowan Williams, NT Wright and Karl Barth are false teachers. Now Michael Jensen has weighed in with his views on the matter. A follow up comment on that post gave his position on the issue with some clarity. I’d have to say that’s where I sit on things – but all those other posts (and I think, my comments) are well worth reading if you’re at all interested in a somewhat contentious issue. 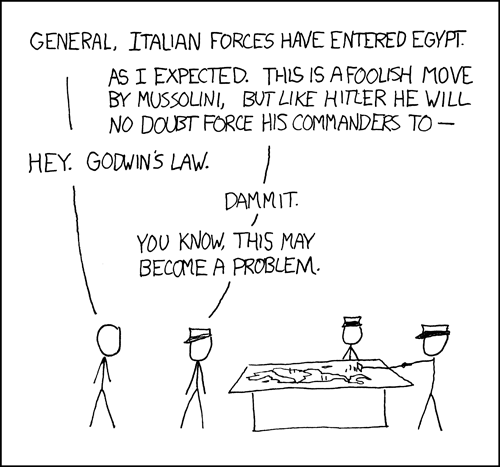 I mentioned Godwin’s Law in the last post. It’s an interesting law – originally coined by Mike Godwin in 1990 to address the trend of usenet users throwing Hitler into arguments. The basic application of the law was that the first person to mention Hitler lost the argument. Godwin has an interesting explanation of his side of the story here. The problem with people blindly accusing people of breaking Godwin’s Law is that they’re going by the letter and not the spirit of the law. This probably only happens to me, because I engage in frivolous discussion with art studenty type geeks people… the kind of people who know what Godwin’s Law is to begin with. There’s another article on pretty much the same thing here. That argues the repeal on the basis that Hitler should be fair game as a test case in arguments. 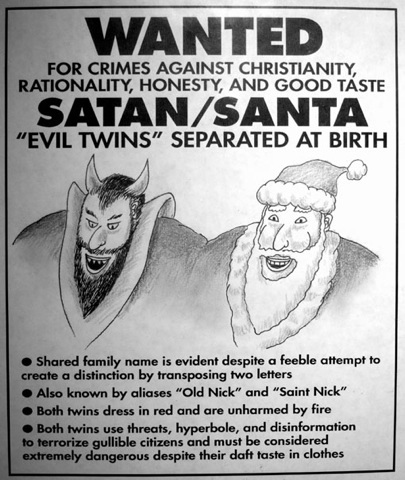 And another link linking Santa to Satan… and this one even mentions Harry Potter for good measure. If the most productive time of salvation are the pre-teen years, and if the pre-teen years are the most vulnerable – does it not stand to reason that Satan would fiercely attack this time? Can we not see the overwhelming evidence of this Satanic attack on our children? From the sexual, sensual music of Britney Spears, or Nsync, to the occult and witchcraft of Harry Potter – there is an attack aimed directly at our children. It is assaulting them from the TV, the music, the Internet, the peer pressure, the public schools – Satan literally “seeks” to “devour our children” into every nook and cranny. * An elderly man, jovial and friendly and of heavy build. * With a long white beard. * His element was the fire and his color red. * Drove a chariot drawn by two white goats, named called Cracker and Gnasher. * He was the Yule-god. (Yule is Christmas time). * He lived in the Northland (North Pole). * He was considered the cheerful and friendly god. * He was benevolent to humans. * The fireplace was especially sacred to him. * He came down through the chimney into his element, the fire. Another interesting trait of Thor is recorded by H.R. Ellis Davidson in Scandinavian Mythology, “It was Thor who in the last days of heathenism was regarded as the chief antagonist of Christ.” (Davidson, H.R. Ellis. Scandinavian Mythology. New York: Peter Bedrick Books, 1982, p. 133) In case you are not aware, an “antagonist” is an enemy, adversary or replacement. – Some of these could be worth a non work time watch. This blog is worth checking out – he’s committed to writing 22 word posts. I like it when a post I’m writing tangentially leads to a new post. In the caption of that font message I mentioned silkworms – I can’t mention silkworms without remembering the quite excellent Amiga game that went by that name. It featured a jeep and a helicopter in two player mode – and I wasted enjoyed countless hours hunched over my side of the keyboard while my friend/family member hunched over the other. I’m going to have to track down a downloadable version when I get home.